Interested in Natural History? Do you love birds? Would you like to own an exquisite wall poster produced in South Africa by Korck Publishing? Now’s your chance to get the perfect up-to-date wall poster you always wanted and at a price that you can afford …. Available worldwide right now. And there are 35 more like this. 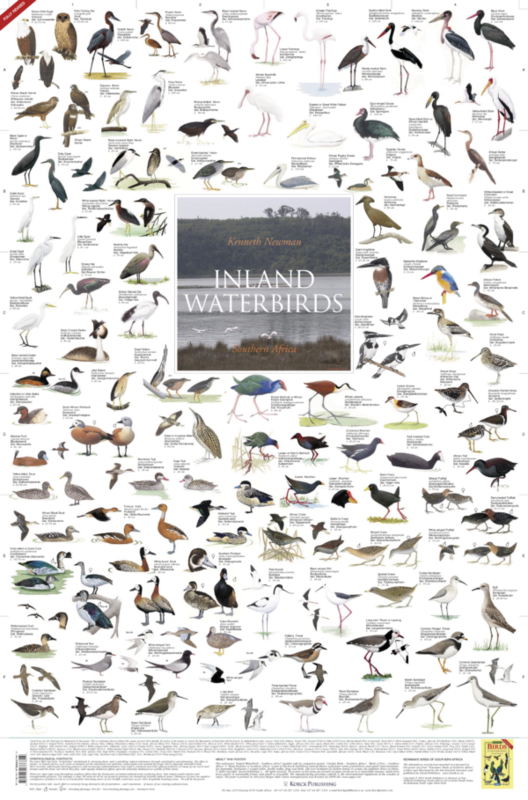 “Inland Waterbirds of Southern Africa – (Fully Revised)” is one of 36 beautifully illustrated natural history posters produced by Korck Publishing. Among the bird families shown on this poster are: bittern, cormorant, crake, duck, egret, flamingo, flufftail, gallinule, goose, grebe, heron, ibis, jacana, kingfisher, moorhen, pelican, plover, sandpiper, snipe, stork, teal and tern.